These photographs first appeared September 6, 2000. This week: Barry Bertenshaw, a Whaler enthusiast from Ohio, sent these great photographs, most taken at the recent Whaler Rendezvous on Lake Erie's Put-In Bay, which was sponsored by Portage Entry Marine. By the way, I am way behind on posting photographs that have been sent in, but please bear with me, we'll catch up all fall and winter after the boating season has ended for we northern Great Lakes boaters and there's nothing left to do but think and talk about boating while we watch the ice form on the lakes. North of Lake Huron's north shore in Georgian Bay, the calm waters of Mill Lake on Collins River Inlet provide the backdrop for this afternoon boating in Classic Whaler style. The low sun casts a warm glow to all that lovely teak trim in the cockpit and gunwales. 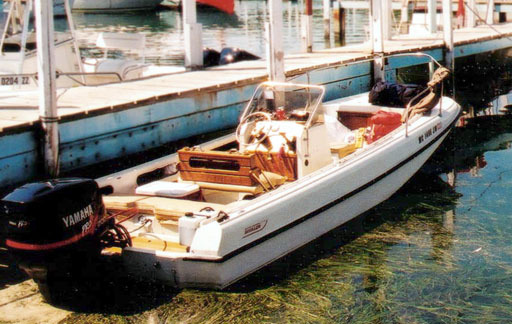 Attached to the Whaler-Drive are twin 150-HP Evinrude engines. Owner Dan Deaver of Cincinnatti, Ohio sits under a custom radar arch and behind some interesting custom canvas. Photographer Barry says Dan "was kind enough to give my two boys and I a ride in her!" That sounds just like most Classic Whaler owners I have met, too. This hull started out in the military and was used in Dessert Storm. 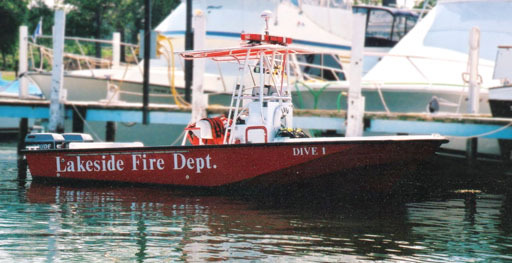 After that it swam all the way to Lake Erie and metamorphasized into a dive boat for the Lakeside, Ohio Fire Department. I got some expert help indentifying this Classic Boston Whaler. It's a c.1977 19-foot Outrage with the early style hull that featured a low rub rail and a rounded bottom aft. Spotter Tom Dondero has one just like it. This boat has survived into the new Millenium with enough integrity to stand up to 200+ horses of new Yamaha power on the transom. 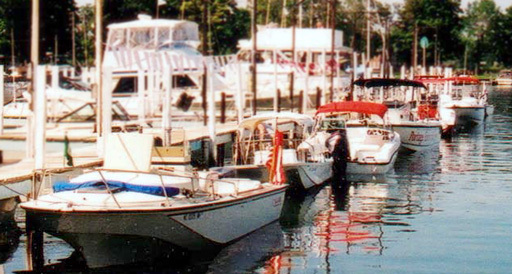 This shot was taken at the 2000 Whaler Rendezvous on Lake Erie's Put-In Bay sponsored by Portage Entry Marine. Northern fishermen always seem to prefer a cuddy cabin arrangement over the more popular (down south) open center cockpit style of boat. 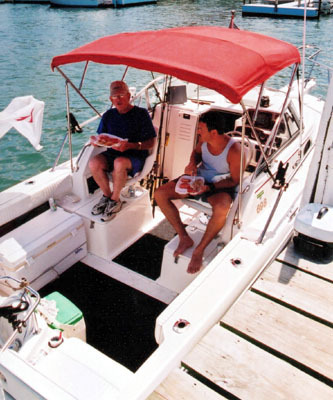 These two Lake Erie walleye hunters from Dayton, Ohio are having a little breakfast aboard their Conquest 21--some walleye they caught earlier that morning! 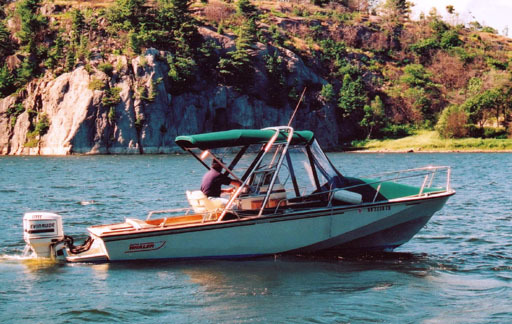 Boston Whaler dropped this smallest cuddy in 2001, so I guess that makes this one an instant "classic." This is really a Classic Boston Whaler picture. Not just because of the '74 Montauk with '94 Merc 90-HP on the transom, but because of the two young boys hanging on to her lines, Mathew at the bow, Daniel on the stern. 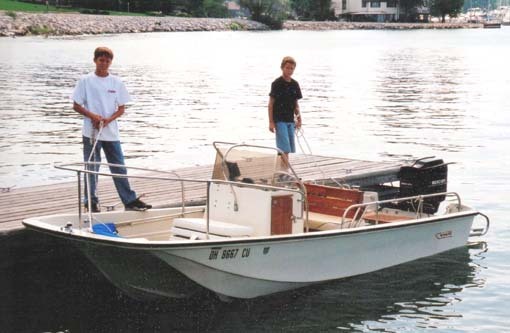 When you think of small boats and young boys, it is the unsinkable Boston Whaler that comes to mind. "Getting to the Rendezvous," writes Barry, "was our first time on 'big' water. Wind was out of the north and we had a rough ride to South Bass. We were only able to do about 8-10 MPH heading into the 2-4 foot waves. So it took a while but the boat did great."